If nothing else, this week's AGM showed that there was such thing as a Reverse Draft, which is something that happened from 1966 to 1975, in which players could get picked off from teams rosters if they were left unprotected. Almost a primitive Expansion Draft. Even so, this goalie goes with the formula of having a couple good seasons in the minors, then having a nice lead-in when he came into the league, but fizzled out before he could do anything substantial. This week, we look at Curt Ridley. Ridley started off with the Portage Terriers in the Manitoba Junior League, playing 78 games in two years, putting up five shutouts in that time frame and 3.59 GAA in those two years. Apparently, Ridley got a reputation for hacking at the ankles and legs of opposing players, riling up the opposing fans so much, they would start to throw stuff at him during the game. In his second year, Ridley got a call up to the Brandon Wheat Kings for five games with a 2.81 GAA. His performance was good enough for the Boston Bruins to draft him in the second round of the 1971 Draft. The Bruins placed Ridley in the Central League for the 1971-72 season with the Oklahoma City Blazers. It was a rough first year for Ridley, going 12-18-4 in the 41 games he played in, losing the only playoff game he played in. The 1972-73 season saw Ridley head to the IHL with the Dayton Gems, playing 56 games with a 2.70 GAA, despite a knee injury he suffered during the season. He also went 3-3 in the playoffs with the Gems and would get a call-up to the AHL Boston Braves for the playoffs, but would go 0-3. With many goalies in their system, the Bruins thought they would take a chance with leaving Ridley unprotected, not thinking anyone would need a goalie. However, for the 1973 Reverse Draft, the New York Rangers plucked Ridley off the Bruins roster and would send him to the AHL's Providence Reds. With the Reds in 1973-74, Ridley came into his own going 19-11-6 in 39 games for the Reds. Ridley would get the starting role in the 1974-75 with the Reds, playing in 57 games with a spectacular 32-14-9 with a 3.27 GAA, but only went 2-4 in six playoff games. Ridley would get a call-up to the Rangers, playing in two games, going 1-1-0 in his games with the big club. His time in New York didn't last long as the Rangers traded Ridley to the Atlanta Flames for Jerry Byers in September 1975. Ridley would be assigned to the Tulsa Oilers of the CHL and would play there for 30 games going 15-10-5 with two shutouts. Ridley's play got noticed, as he would be traded by the Flames to the Vancouver Canucks in January of 1976 for the Canucks first round choice in the 1976 Draft. As an aside, though he left Tulsa early, he won the Terry Sawchuk Award for fewest goals-against. Ridley got the call-up to the big club immediately and did an amazing job in his nine games with Vancouver, going 6-0-2 with a 2.28 GAA, which was promising to the Canucks brass. It was a promising sign, but the 1976-77 season didn't being much fortune with that quick start. Ridley was battling Cesare Maniago, but didn't fare well with a 8-21-4 record. The 1977-78 record was more of the same, as Ridley would improve slightly with a 9-17-8 record in 40 games. The Canucks sent Ridley down to the Dallas Black Hawks of the Central League for the 1978-79 season, where it seemed that Ridley was able to gain his confidence back. Ridley would post a record of 22-10-0 in 32 games, going 8-1 in the playoff to help the Hawks win the Adams Cup championship. Ridley would also take home the Max McNab Trophy for Playoff MVP. Ridley would start the 1979-80 season with the Hawks, going 0-4-0 in his four games; but would still get a call-up to the Canucks for 10 games, in which he would go 2-6-2. Even so, Ridley had some interest as the Canucks traded Ridley to the Toronto Maple Leafs for cash in February of 1980. He would only play three games with the Leafs and go 0-1-1, as he broke his hand in his third game in. The 1980-81 season saw Ridley go to the AHL and play with the New Brunswick Hawks for two games with a 1-1-0 record, with a three game call-up to the Leafs with the same 1-1-0 record. After not being re-signed by the Leafs, Ridley would sign back in the Central League with the Cincinnati Tigers as one last kick-of-the-can. He would regain some kind of stellar play, going 10-6-1 in 22 games, while losing his own game in the playoffs. Ridley would hang up the pads after that 1981-82 season. Ridley now resides in the Dallas area, and while he was antagonist in the net; he could never string together much in the NHL when he had his time; whether it was to being pushed out, the team in front of him, or just not being able to get up to the speed of the NHL-- it never gelled for Ridley. 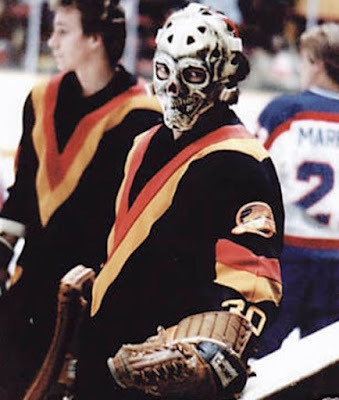 If nothing else, he did have a memorable mask (as seen in the picture) which coincided with the "stick-in-rink" logo that the Canucks had. So, at least he'll always have that. As going with this whole concept, The Girl and I always try to go in behind the name, which has more often than not worked. This one should also go along with the idea behind the concept of starting this up. This one is especially interesting considering the city of Milwaukee is not known as a big naval center, like Norfolk is. However, with it comes to the Admirals of Milwaukee, it really has nothing to do with the rank of Admiral. In fact, the name was brought about by one part of the original group of investors, Edwin Merar. Merar owned an appliance store and actually named the team after one of the appliances that was sold in his store. The first incarnation of the team started in the 1970 with a generic hockey player with a red, white, and blue background and "Milwaukee Admirals" around the border. The first "skating sailor" logo didn't come into play until 1977 when they moved into the IHL. As you see by this logo, the sailor does look a little dopey with the hat over his eyes, but it was beefed up in 1982 with the sailor looking a little meaner and bulkier. The color scheme stayed red, white, and blue until 1998, when the colors changed to a burgundy, bronze, and navy scheme. The logo itself was reinvented to just a head-shot logo, with a more pronounced hat onto of his strong-jawed head. While the jersey design prior was plain, the new colors brought in a new scheme with a wave design along the hem of the jersey, which was more solidly done than what the Islanders did with their fishermen gimmick. 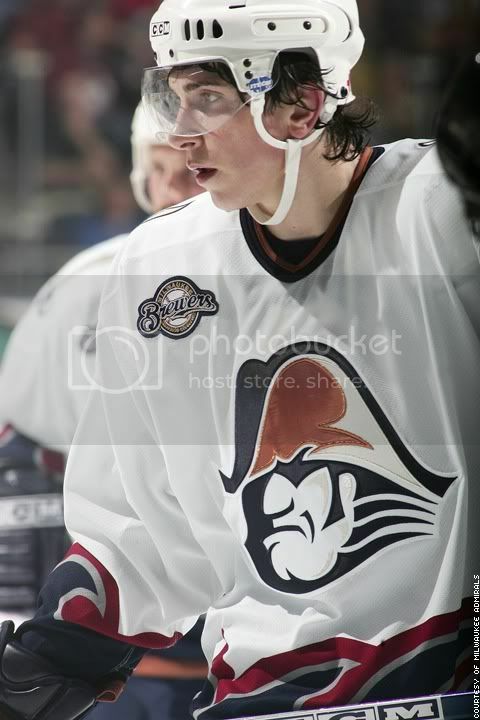 One interesting thing about the Admirals happened when they came into the AHL in the 2001-02 season. The Admirals were a part of the IHL teams that moved to the AHL, but there was already an Admirals place in Norfolk who had arrived to the AHL one year beforehand. Both brands where strong in each of their markets, but was there going to be any pressure for the new Admirals to change or would there be a CFL situation where there were two teams with the same name at the same time?? "There was no pressure to change our Admirals name when we came into the AHL," said Tim Van Wagoner, Director of Marketing for the Milwaukee Admirals. "Maybe if we were in the same conference with Norfolk it might have been a different story." So, there you go; the league could be able to co-exist with two teams with the same name around. And it worked well for the Admirals, as they saw success in the new league and it got them a Calder Cup championship within two seasons of being in the AHL. One interesting thing is the inclusion of the Milwaukee Brewers logo on the jersey seen here and here, with many Brewers themed nights, as seen in the second picture. That's because the investment group that owns of the Admirals consists of many in the Brewers organization, including Brewers owner Mark Attanasio, Brewers assistant GM Gord Ash, and former Brewers pitcher Ben Sheets. 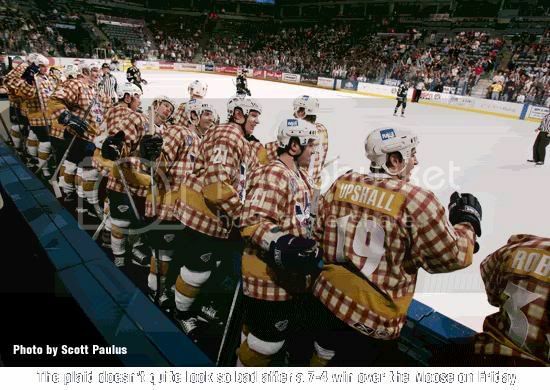 The Admirals got very much into the Brewers theme, having a night dedicated to Brewers announcer Bob Uecker, which brought about some of the most memorable jerseys ever to grace the ice. "We felt like we needed a new logo when ownership changed. Our new look is meant to stand out and cut through clutter, and appeal to the merchandise buying public, like teens and tweeners," Van Wagoner stated. "We sold more in the first month than the entire previous year and see our stuff around town frequently." To go from a pretty well established brand in Milwaukee for close to 30 years and see the change be accepted that quickly shows how a drastic change can appeal to another demographic as well as the demographic you had following you previously. Plus, their jerseys have quite fantastic appeal-- with a set in ice blue, silver, white, and recently black. While the jerseys are pretty snazzy, the one thing that does irk me a bit is the socks with the vertical stripe. Maybe because it's new, but I've never been a fan of the vertical striping on the sock, even when it comes to the national teams. 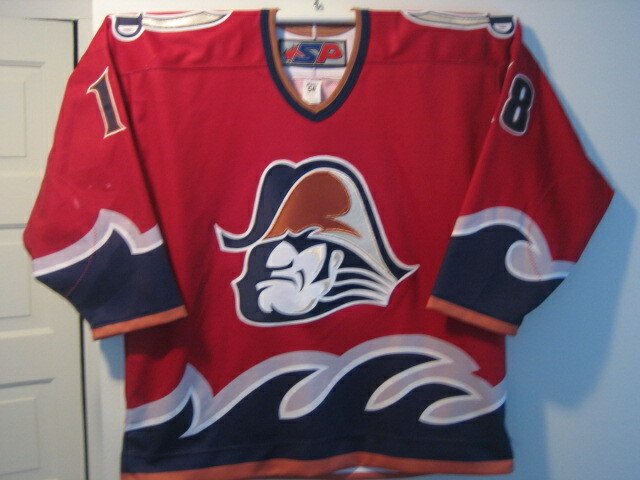 As a whole, the Admirals scheme is a solid one, even if they did pull of a drastic change from what built up their identity. It has worked for them and seems to garnered new attention from a new fan base, which is something that feeds the identities in the first place. Thanks to Tim Van Wagoner, Director of Marketing for the Milwaukee Admirals for helping with this piece. Head to MilwaukeeAdmirals.com for all information for the Admirals. Now, with all that's going around-- I could opine on what the great Greg Wyshynski had to say about blogger credentials, but he discussed that with us and Lyle Richardson at the 2009 Draft already.Plus, I've been credentials for years and I still can explain the process due to my hackiness. I could talk about the Olympics and what it could mean, but the nuances around it are too much for me to debate with myself. But the topic I'll tackle is the fantasy hockey side of things, that is now in full effect. The FOHSHL has gotten back up with our four divisions getting rolling, I got an email about my CBS "Experts" league getting going, it's finally the time of the year where the ordinary people can become very psychotic about players performances and what not. You can be the guy behind the guy and only have yourself to blame for picking some craptastic guys.....or play the blame game after the season and single out players like some GMs in real life do. I know I put out my confession of the addiction back in '07 and it holds true to the day. Even so, with one draft 35 days away-- the strategy has been on-going since the whole free agent period when you're thinking how each new signee will fit into the scheme of not only the team, but his value when you could pick him and if they could become a sleeper. I know there has been many times where I assumed one thing about a player and the exact opposite happens; which is what makes it aggravating at times, but that's life. It creates challenges and a sort of an escape for things to make yourself feel bigger than you really are....which is fantastic when you have a sort of Napoleon complex. The thing with the whole fantasy process is not only battling other owners in terms of drafting and free agent position, it's more of battling yourself and your own decision making process. The fact of the matter is that you are your own worst enemy. The second-guessing issue is mostly the big thing, not only in drafting, but in putting in a claim for waiver processes, quick fixes for late-week points, or even being too late in picking someone up off of free agency when you had been debating in your head on picking them up. Oddly enough, the regret you have for not picking someone very much outweighs the good moves one can actually make. It's the fish that got away scenario. More over than second-guessing, another thing that irks me is the owners who don't actually pay attention to the entire season. I mean, I know there's people who do have lapses when it comes to the day-to-day games and that's fine. It's the guys who don't check their teams at all that bugs me, especially when you want to make a trade and since they don't check the team-- it never happens and you feel that you lost out because of it. That happened to me a couple times in the past few years and it's bothersome-- especially when the commissioner of the league trusts that owners will keep track regardless of how bad their team is. It's hard to bag on them, though, because in most cases they are your friends or it's a public league where people seem to be more idiotic than not. The point is-- even if you just check your team once a week, make sure you keep tabs on your teams because while you might not care halfway through the season, some other owner may when it comes to your roster. And speaking of public leagues-- the best part about public leagues and one that has been great fodder for FOHS is the trades that are proposed through the season. The public leagues bring the silliest of trades, mostly because people underestimate the knowledge of their leaguemates and assume most everyone in a public league is a dumbass who is only there just because and to try out hockey for the first time. It never seems to happen in private leagues because people usually know better, but it also is a sign of the times where not many trades (at least in the FOHSHL) have taken place. It's like there's a salary cap in fantasy hockey and no one has the cap space to fit one guy or another into it. It's crazy because, like in real hockey, trades are very interesting and something that could make others make moves here and there. While there's another peeve some guys have, but I can't complain because I've done it myself-- where an owner drops a ton of guys to pick up others just to get points late in the week. Now, I've only done that with a lot of rank-and-file guys and at the end of the Finals during championship week, which-- in championships-- any means necessary. Even so, it's a little bothersome when it comes to guys doing it frequently; but like I said-- no room to talk since I've been guilty of it from time-to-time. On Tuesday, the topic at the World Hockey Summit was the happenings between the NHL (and rather North America hockey in general) and Europe in terms of some teams "over fishing" the European leagues in terms of talent and plucking the home-country leagues of talent, especially in terms of their junior leagues. This ideal of "over fishing" was brought to life by Slavomir Lener's presentation about the how the Czech and Slovak juniors league have had their talent taken away by some agents luring them to North America to play in the Canadian Hockey League or even the NHL. Lener is the director of the national teams in the Czech Republic and showed that with the performance in the World Juniors and how the Czechs haven't been on a WJC podium in five years. Also, he stated that NHL GMs are noticing that the talent that was there like Jaromir Jagr and Marian Gaborik are being turned out much anymore, which....I don't know how that's the fault of developing in North America, but whatever. The main point is that Lener said because of the players leaving their home country early, the never develop into what they could because they're lured away by the allure of the NHL and North American hockey in general. While, Lener does have a point, the fact of the matter is that I don't see how players migrating from Europe to North America is a big fault to the country's standing in the World tournaments. Regardless of where they are playing, they are still going to be of their nationality and still play for their country. If it's a philosophical thing between playing in North America and then for your home country-- that I can understand due to the different schools of thought each coach has when it comes to players. However, the CHL still has a rule that only two imports can be on a team, while the NHL has to deal with a transfer issue when it comes to getting players out of a contract in their home country's league. Yet, why should the CHL be ran down because of the fact that they give the exposure and training for the next step, which is the NHL?? If anything, the model they have should be taken by these junior leagues in Europe and maybe implemented in some ways over others. It doesn't seem like Sweden and Finland have issues of their junior leagues being completely run down with the CHL looming overhead. Maybe it has nothing to do with North America's intrigue, but just the lack of structure in the leagues over in the Czech Republic and Slovakia. Plus, you have other countries, like Switzerland, who have some guys in the CHL and even in the pro leagues in their country and succeeding in the junior ranks; so I don't know what's going on with the Czechs, but it's nothing to do with the North American game or not "fully developing." Also on Tuesday, Rene Fasel of the IIHF was a bit on the heel side of things on this, by going on to say that the NHL won't get a division in Europe while he is sitting as the head of the IIHF. 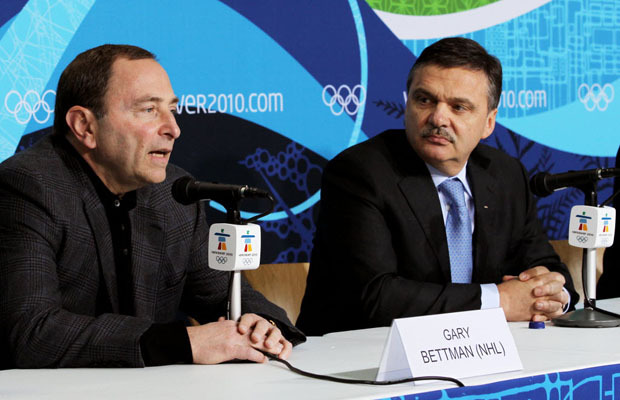 Fasel also said that the NHL being in Sochi Olympics is a must. As far the the Sochi Olympics goes, I think it's a formality; to be honest. I totally agree that having the NHLers in Russia playing-- especially with Alex Ovechkin already saying he's going and has the blessing of his owner, so why not send the rest of them?? As far the NHL division, it's kind of a preemptive strike against the NHL, who is holding their Premiere series in Europe, maybe scouting out the territory. And why should the NHL want to go to Europe, aside from more money given to the league and teams. The teams are out of the control and if they are going over to Europe to have another 10-12 leagues, that would thin out the talent to the point where it'd be unbearable. If anything, the trips to Europe or less about scouting the territory, but to give the people a look at live action they wouldn't be able to see unless they wanted to drop a nice sum of cash to not only travel there, get shelter, and then find tickets. This way, it's closer with some decent teams and decent action. And in the end, I don't think the NHL European division would be the best for the league or for Europe. The fact these countries and territories have their home leagues is something that would instill a bit of pride and there's no reason that the NHL should disrupt it. Even in North America, there's a lot of pride in the minors and some people who dislike the NHL because it messes with the minor leagues and leads to teams moving because of it. For what it's worth, the state of hockey in Europe is something that should be looked at in some cases. When it comes to the Czech and Slovak leagues, that's a matter of getting better coaches or developers over there to teach these kids and actually develop them so that they can leave at 18 or even make those league desirable for the younger generation and be a pioneer of sort. The reason some kids leave is because of the fact they feel they're ready to get to their next level and aren't content with staying at home and maybe getting stuck because they waited to long. You can't fault other leagues or what-have-you for the shortcomings of your own program. We start the second year of the AGM (odd, isn't it??) with someone that is a jack of all trades....in his own mind, I'm sure. This week's AGM saw it from on the ice and off of it on the bench. That said, he can tout that he's the best bagpipe player the NHL has ever seen, to which I'm sure not many will challenge him. This week, we take a look at the career of Glenn Healy. Healy started off playing in the Metro Toronto Junior Hockey League with the Pickering Panthers, playing 66 games and ending out with a 3.73 GAA over two seasons. After the Panthers, Healy moved onto the college ranks, playing for the Western Michigan University Broncos at the start of the 1981-82 season. In his freshman year, Healy played 27 games and went 7-19-1, though WMU didn't go far in the playoffs of the CCHA. Healy was able to get more games in his sophomore season, but it wasn't much of a different result. Healy went 8-19-2 in 30 games; with the Broncos falling short of any post-season success. By the 1983-84 season, Healy and the Broncos got better, as Healy played 38 games, going 19-16-3 and help the Broncos get to the CCHA Finals, but lost to the University of Michigan. By Healy's senior season, he had come into his own and went 21-14-2 in 37 games, as well as capturing CCHA Second Team All-Star honors and NCAA Second Team All-American honors to close out his college career. In the summer of 1985, Healy signed with the Los Angeles Kings as a free-agent and would start out in the IHL with the Toledo Golddiggers for the start of the 1985-86 season before being called up by the Kings to get a start in November, one of which he replaced Darren Eliot and got a no-decision. After that, Healy was sent to the New Haven Nighthawks of the AHL and would get a bulk of the games over the rotation of goalies there, playing 43 games and going 21-15-4. Healy would stay in New Haven for the 1986-87 season, playing 47 games and putting up a 21-15-0 record, while going 3-4 in his seven playoff games. In the 1987-88 season, Healy got the call-up to Los Angeles full-time to back-up Rollie Melanson and did respectable with a 12-18-1 record on a so-so Kings team. Healy would get a boost by being the starter for the Kings, while the Kings got a boost with getting Wayne Gretzky. Healy would play 48 games and improve tremendously with Gretzky and the likes being in front of him. Healy went 25-19-2, but Healy lost his gig before the end of the season to Kelly Hrudey; who was acquired mid-season. With Hrudey taking the reigns, Healy was set free by the Kings and would sign on with the New York Islanders in the summer of 1989. Healy would split games with former AGM Mark Fitzpatrick in his first season on Long Island; getting 38 games in with a 12-19-6 record. Healy would become the starter before the 1990-91 season, as Fitzpatrick was sidelined with Eosinophilic Myalgia Syndrome of the blood. Healy was still on a subpar team and only had an 18-24-9 record in 53 games, but had a 3.32 GAA in the process. Healy dealt with injuries in the 1991-92 season, as he fractured his finger, thumb, and had his finger-tip severed during a practice. Even through all of that, Healy had a 14-16-4 record in 37 games. It was a more fortunate 1992-93 season, as he took the 1a spot over Fitzpatrick; playing 47 games and going 22-20-2, as well as take the Islanders on a solid playoff run, going 9-8 as the Isles lost in the Conference Finals to the Montreal Canadiens. It was an eventful summer of 1993 for Healy, as he was left unprotected by the Islanders in the Expansion Draft. Healy was claimed by the Anaheim Mighty Ducks in the first phase. However, in the Phase II Expansion Draft, the Tampa Bay Lightning claimed Healy from Anaheim, which was the next day. That same day, Healy was traded from Tampa to the New York Rangers for the Rangers 3rd Round pick in 1993, which was actually Tampa's because Tampa traded it to the Rangers. Got it?? Great. With Healy knowing that he's in the Big Apple for the 1993-94 season, he settled himself into the role of the back-up to Mike Richter. 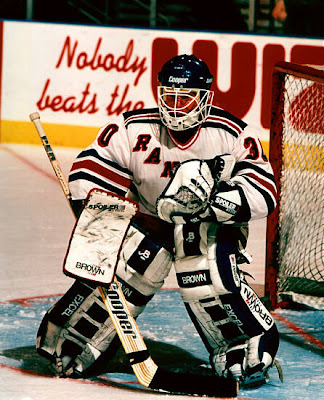 Healy saw 29 games of action and went 10-12-2, as well as two games of playoff relief action, as the Rangers went onto win their first Stanley Cup in 50 years. Healy only got 17 games of action in during the lockout shortened 1994-95 season, as he went 8-6-1 and actually got a couple votes in the Vezina race, which he finished 13th. With Richter dealing with a groin injury, Healy got more playing time for the 1995-96 season, getting 44 games in and going 17-14-11 with a 2.90 GAA during the start of the "dead-puck" era. Richter was healthy again and Healy was put back on the bench, but he didn't fare too well in his 23 games with a 5-12-4 record to show for that season. Healy wasn't retained by the Rangers and it wasn't until August of 1997 for the Toronto Maple Leafs to sign him to back-up Felix Potvin. For that 1997-98 season, Healy deal with some pulled groin issues, which restricted him to 21 games and a dismal 4-10-2 record. With the Leafs signing Curtis Joseph and still having Felix Potvin; Healy was sent down to the IHL's Chicago Wolves, which was the first time since his career started that he was in the minors. Healy said about his experience, "One road trip, were stuck on the runway for two hours. The plane kept driving and driving until we arrived and I realized that we were on a bus!!" Healy would spend 10 games in Chicago going 6-3-1 before receiving his call-up back to Toronto after Potvin was traded. Healy started for nine games, going 6-3-0 in those games. Healy was back full-time in Toronto for the 1999-2000 season, backing up Joseph, which got him 20 games in, but with a 9-10-0 record. The 2000-01 season would see Healy get less time as the workhorse of Curtis Joseph showed, as Healy got 15 games in for a 4-7-3 record. It would be Healy's last season as he would hang up the pads after the season. We all know Healy now as a commentator for CBC's and formerly of TSN. Healy also played a role with the NHLPA for a year during the two-year tenure of Paul Kelly, but quit when many of the NHLPA members question his credibility for the job. Healy was always known as a good man and good teammate, as well as an accomplished bagpipe player. In fact, in the summer of 2000, Healy injured his hand while changing bags on his bagpipe, but was healthy enough to be ready for the start of his eventual last season. Healy was part of some not-so-great teams, but had some great moments and played in some historic hockey cities along the way. While he may have not gotten as much time in net as he would have hoped, he did what he could when he was out there, especially with some of the teams that he had in front of him in the start of his career. Alright, since NHL's Concept Car of Rule Change Expo has ended; it's time to take it all in, see what worked, what didn't, and where common sense all lands for me personally. Sure, the craziness that ensued was something to get the internet a-typin' with rage and debate. We'll take it step-by-step (day-by-day) when it comes to some of the ideas that came out of camp and see what'll stick when thrown at the wall. -Icing: For many, this will be the rule that will probably be the first in the line to change. Both a no-touch and hybrid, which is up to linesman digression, were tested out. With the issues that have happened recently, you can bet that no-touch icing will be the thing that gets called out to the floor and utilized. The idea of a hybrid seems alright in theory, but there's too much of a gray area and nothing uniformed for the linesmen to look at; thus making it a dicey move to go with. While Sean-O had an idea of moving the icing line up so that it's different from the goal-line, but in the end, it could get a little crazed to begin and may never catch on. -Face-Off Techniques: One of the interesting spots was the "choose your opponent" option should someone get thrown out of the face-off circle. It would definitely allow for more options and make all the players self-aware when it comes to trying to jump the gun. Another thing would be the "lacrosse face-off" option, whereas the ref puts the puck in the circle and blows the whistle to start play. If someone jumps, possession goes to the other side. The lacrosse option does seem like it's a bit much, but something that would be too much shades of gray. Finally, a penalty line which is a foot back from the dot if a player jumps. Again, a gray area-- especially with linesmen often stalling and holding the puck much too long on the draw. All of these are very innovative, but the "choose your opponent" option may be the one who wins out in all of this, if any of these rules are implemented, as it would keep the game with the same flow; but as more intrigue in terms of match-ups. -One Dot Per Zone: One change that created some of the most buzz was the one face-off dot per zone. It turned the attack zone into a Cyclops looking area rather than boobage. This is also probably one of the most extreme changes. If nothing else, the change could create the most own goals and goals off the face-off ever. While it won't happen in our lifetime, the fact they tried it out seemed to maybe foreshadow what could happen. Of course, this sparked my mind of the NHL using this as their "Concept Car" when it came to this camp. -Net Gains: Some changes to the goal area, from a plexiglass top to the net for better sight on goal reviews to shrinking the shallowness of the net in order to create more wrap-around chances and area behind the net to a thinner mesh used around the net. While I only support the plexiglass, the isse of where a water bottle would be placed is one thing, as well as keeping it clean and even with all the bodies in the way would only be a band-aid for the problem. The thinner mesh seems silly due to the heaviness of the shots and could create a record in net repairs if used. -Officiating From On-High: The option of the second referee off the ice surface, lording over the play is something I can get behind, though you can debate he was doing the same job on the ice. At least with this, the players would be more away seeing him tower over the ice surface. One of the ideas that were looked at, which could be the towering refs domain, is the "bench crease" to show the refs how far out players are from the bench when they change. While this does save the refs from themselves, as well as players knowing when they can go; it almost starts to look like a D-III basketball court with all the lines for volleyball and shorter basketball courts. Another "good in theory" idea, but you would hope the players wouldn't have to be babied like this, as they are professionals. Plus, it's not like those rules will be bantered over if someone jumps just a bit early while the guy he's coming off for is still out of the crease. Now, if they use it as a DMZ and any amount of players can be in that area without getting caught-- I could see getting behind that. There were some others like the offside rules of not being able to change or the face-off going into the other attacking zone should it be that way-- but I'm neither here nor there about that. In the grand scheme those ideas I mentioned were the most extreme in my eyes and it's doubtful that many of them will be accepted, sans two or three. Obviously, there will be some other leagues playing the role of guinea pig to test these out if not fully accepted, which would cause those fans to get up-in-arms over things. 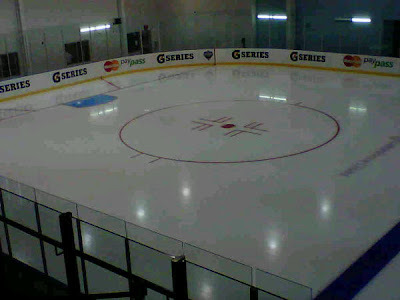 In the end, to change for change sake is something the NHL doesn't want to do, and they've said that, which I believe. They get enough flack as it is for changing some aspects of the game, no matter how tiny. However, many GMs have said the no-touch icing is a no-brainer and if only one rule gets adopted, it should be that. They are onto something with that and fully back them in that. 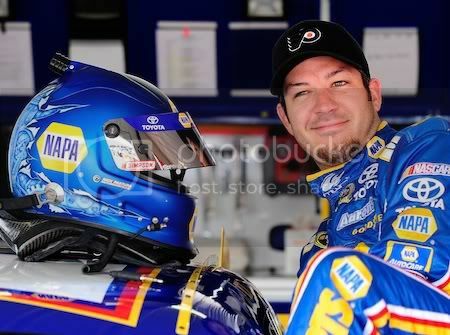 As many of you may (or may not) know, as much as I'm into hockey; I'm also into the other oft-bashed sport-- NASCAR. In fact, myself and Todd "Wilson" Butts used to do a NASCAR internet radio show called "Pit Stop Radio" from 2001 until 2005. Todd has moved onto Wilson's Race Report and far surpassed the fame I have, but that's neither here nor there. The thing that I've notice is how closely the two sports intertwine and intermingle in terms of promotional events. Also, these are sports that have their niche markets and have tried to expand out to the more mainstream across the country and even in other continents. Granted, NASCAR has seen a bit more success when expanding into the mainstream; even though they have plenty of detractors for one reason or another. Notwithstanding, there's a decent amount of parallel with the sports on the surface. When you look deeper, you can see a lot more parallels when it comes to the two, especially when it comes to the minor leagues and their promotional activities. Before we get to that, we have to start out with one of the first cross-promotional items between the two sports. It happened in 1997, the first year for the Carolina Hurricanes. 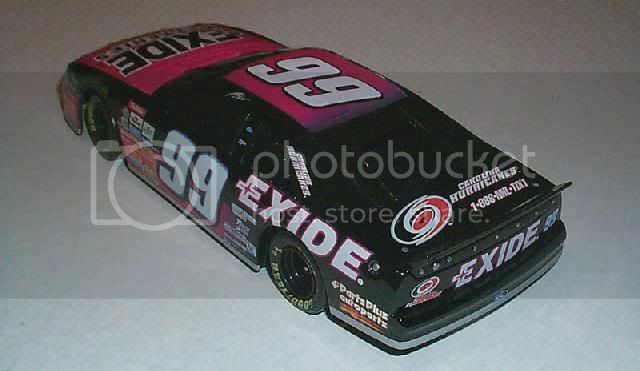 To get their name out there to the masses after the move from Hartford, the team bought space on the back deck-lid and bumper of Jeff Burton's #99 Exide Ford. They call NASCAR the fastest billboards on Earth and it seemed to get some word out there for the masses. 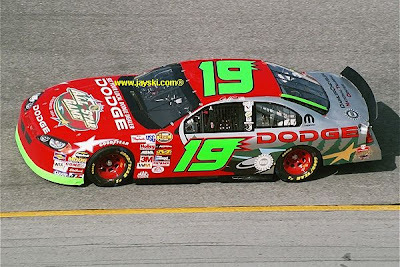 While the Burton thing seemed to be just a one-year deal, the NASCAR community would welcome some more NHL logos in 2004, when Jeremy Mayfield had the 2004 NHL All-Star Game logo on his #19 Dodge Dealers Dodge for the Budweiser Shootout, seen in the picture above. This is when Dodge was the official car of the NHL and they took the chance to get the word out for the All-Star Game during Daytona's Speedweeks. Since then, there has no out and out sponsorship of a team or event. 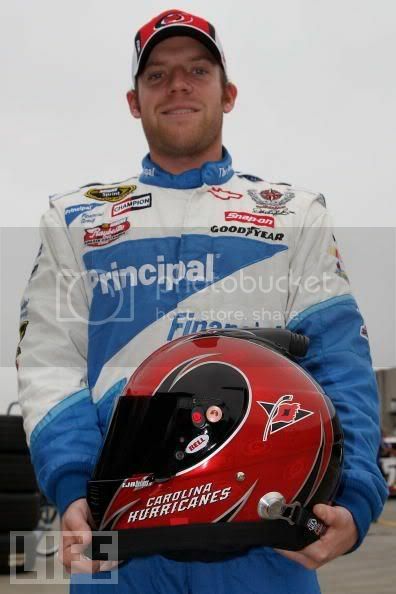 That said, the likes of Regan Smith (formerly of the #01 DEI Chevy) have used the Carolina Hurricanes logo as a design on his helmet. 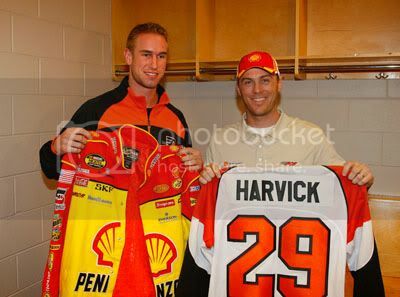 Also, Martin Truex, Jr. of the #56 NAPA Toyota is an avid Philadelphia Flyers fan since he grew up in Mid-South New Jersey and has seemingly pulled Kevin Harvick (seen here with Flyers forward Jeff Carter), driver of the #29 Shell Chevy in with him to the Flyers fandom. Both Truex and Harvick followed the Flyers through their playoff run last season. Harvick also admitted to watching the Bakersfield Condors of the ECHL, which is his hometown team. 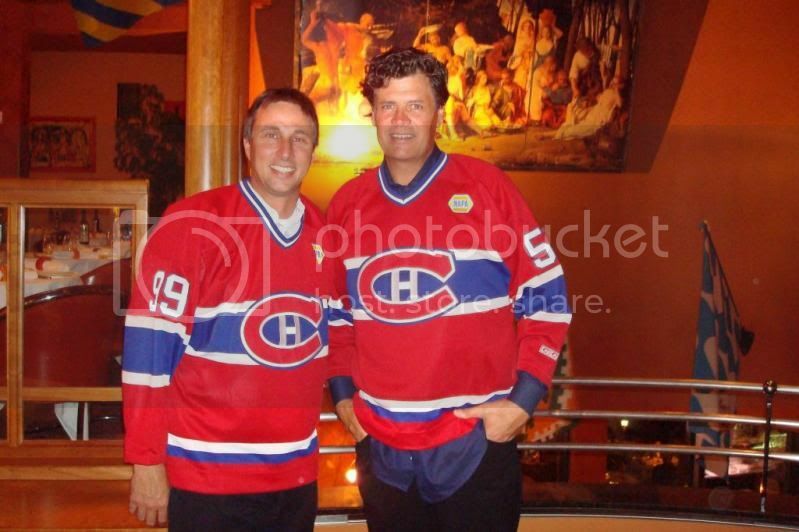 With NASCAR going into Canada, the Montreal Canadiens embraces driver David Reutimann of the #00 Aaron's Dream Machine Toyota and owner Michael Waltrip by presenting them jerseys of the team. 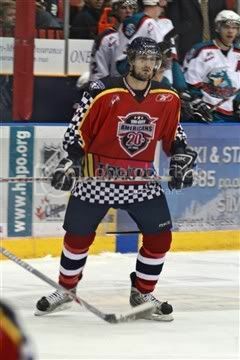 Conversely, there's plenty of hockey teams that incorporate NASCAR into their game-day and jersey schemes. The Charlotte Checkers, where most of the NASCAR teams have their headquarters, often have a NASCAR theme night during the year and the name goes along with the motif of the city prior to hockey. 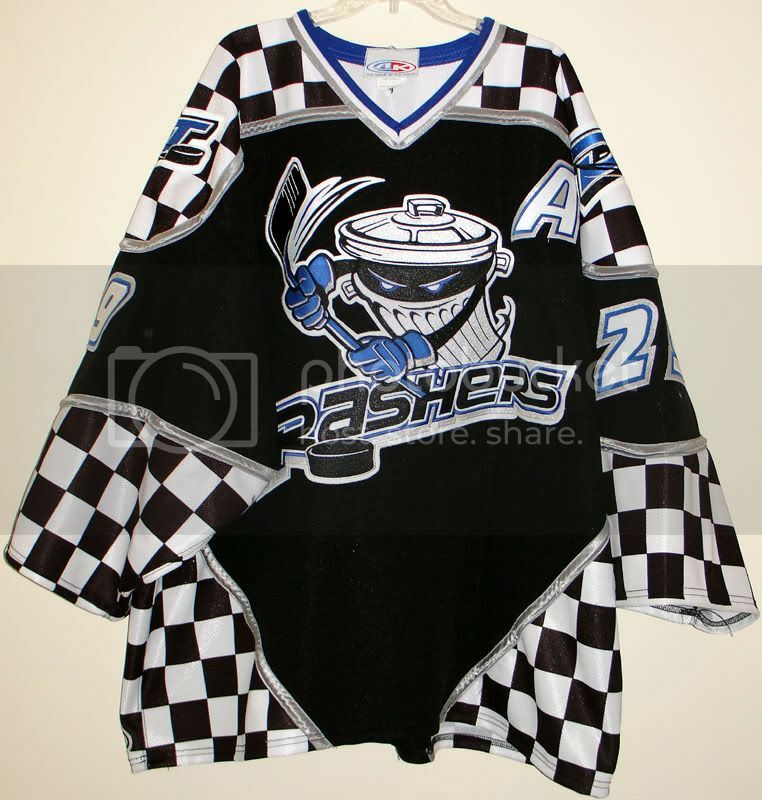 The old UHL has had many NASCAR nights with the checker pattern, as seen here with the Danbury Trashers and many other lower minor leagues and junior teams have done such ideas, as seen by this interesting Tri-City Americans' (WHL) jersey during their NASCAR night. Truex ties into this with being at Syracuse Crunch's NASCAR night in March of 2010. One of the bigger tie-ins happened earlier in the summer with the SPHL announcing that the Ryan Newman Foundation would be a partner with the league and incorporate special nights with all eight SPHL teams for trips to NASCAR events. Ryan Newman is the driver of the #39 US Army Chevy and his foundation educates and supports animal welfare. Newman and his wife are hockey fans and thought that this would be a nice tie-in to the area that the SPHL targets. While they seem miles apart in terms of philosophy, the fans of each sport and the sports themselves are somewhat on par. The fans, most of them are avid and very knowledgeable of the ins and outs of the game, while those who are new to the sport often pick it up fairly quickly and embed themselves quickly. The sports are both quick, high tempo, and often have strategy to them when the game or race is on the line. Of course, hockey can turn in all directions and NASCAR is usually all-left, that's neither here nor there. The point is that while it seems like these two "niche" sports wouldn't be in the same ballpark as each other, they are closer than some would like to admit. When The Girl and I were talking about doing this, the idea was trying to get an idea on why names were the way they were. While most in this project have been "Name the Team" contests, sometimes they seem to link into the location one way or another. 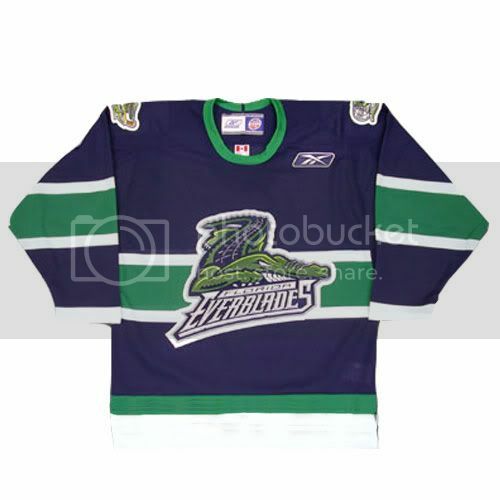 This team is one of them, as the location of the ECHL's Florida Everblades is close enough to the Florida Everglades where the pun is solid and fitting. "With the team being in proximity of the Everglades, the name formed along those lines," said Kevin Reiter, Broadcaster and Public Relations Manager for the Everblades. "It came from similar situations like the old Kentucky Thoroughblades." It may be an odd off-take, but it's something that is catchy and has obviously worked for the team, as the brand is one of the more noticeable when it comes down to it. In fact, only the Wheeling Nailers (1988) and South Carolina Stingrays (1993) have been in the ECHL longer than the Everblades, who have been in the league since 1998. The 'Blades have even used the same logo and color scheme throughout their entire tenure. "The blue and green colors come originally from our affiliation and ownership being the current Carolina Hurricanes and old Harford Whalers. 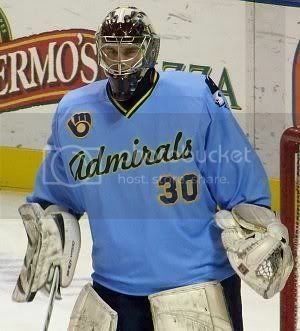 When our team was first introduced we played off the Whalers blue and green colors," Reiter informed me. And I must say, the blue and green combination is underused and a sharp look for most teams who do use it. The jersey schemes they have used are very interesting. They currently use something similar to their parent Hurricanes, with the piping around the shoulder yoke, as well as alligator teeth along the hem. In the past they have done something similar to the Montreal Canadiens' scheme with the stripe across the middle, as well as template like the Nike Swift Olympic jerseys that many countries have used in the past, but with teeth under the arms. Even so, the colors and logo stay the same. At the start, they obviously used something like the Whalers used to use in the template. I think the amazing thing, especially with the changing landscape of minor league hockey; the 'Blades never really compromised for their brand; logo and colors. Sure, their jersey schemes have changed through the years, but the basic principle of their identity has stayed in tact and really should be the blueprint for most minor league teams when trying to be successful. Thanks to Kevin Reiter for the information on the 'Blades. 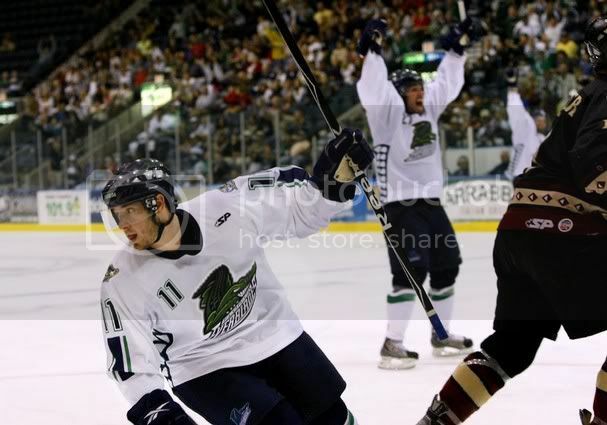 Visit FloridaEverblades.com for all things to do with the 'Blades. The thing with goalies in the late-90s and early-00s is that some of them are becoming more and more absurd by being one-hit-wonders or retiring early due to injury. The latter is the subject of this week's AGM. He was a promising goalie coming up through the ranks in Finland, then bursting onto the scene in the AHL, but due to a clog in the system and then a severe injury playing overseas during the lockout; his playing days are now a memory. This week I'll take a look at Pasi Nurminen. Nurminen started his career out in his native Finland with his hometown organization in Lahti, bouncing between the junior ranks and the Tier II league in Finland for the 1993-94 and 1994-95 seasons. It wasn't until the 1995-96 season where Nurminen got plenty of playing time with Kettera Imatra of the Tier II Division in Finland, playing 36 games, only going 8-21-8 with a 3.97 GAA for the year. Nurminen went back to the Lahti Pelicans for the 1996-97 season, playing 30 games that year with a 2.40 GAA. Nurminen had a breakout season in the 1997-98 campaign with the Pelicans going 16-7-4 with a 1.65 GAA and seven shutouts. Nurminen was able to get a good look in the Finnish Elite League with HPK Hameenlinna in the 1998-99 season, where he would play 48 games and compile a 24-17-6 record with a 2.71 GAA. With the constant movement in Finland, Nurminen went to Jokerit Helsinki in the 1999-2000; again playing 48 games with a 24-14-9 record, a 2.25 GAA, and six shutouts and got him the Urpo Ylönen Trophy as top goaltender award for the year. Nurminen returned to Jokerit for the 2000-01 season and did even better, going 30-11-6 in 52 games with five shutouts and a 2.16 GAA. Nurminen went on to play for Finland in the World Championships, helping Sumoi get a silver medal. That season was enough for Nurminen to get noticed by NHL teams, which got him drafted by the Atlanta Thrashers in the sixth round in the 2001 Draft. 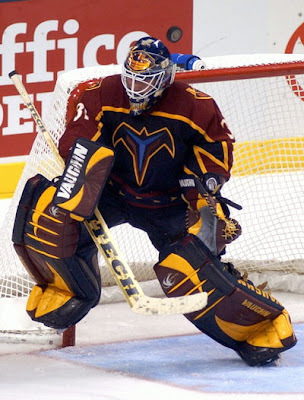 After getting drafted, Nurminen went over to North America immediately for the 2001-02 season, playing with the Thrashers AHL affiliate, the Chicago Wolves. He had to fight for time, only playing 20 games in the regular season, going 9-9-1 behind Norm Maracle. Nurminen got a call-up for nine games, going 2-5-0 with the Thrashers. Also, Nurminen got a call to the Olympics, playing one game and winning it, as the Finns finished 6th. The AHL playoffs, however, were a different story, as Nurminen had the hot hand. He would play in 21 games for the Wolves in the playoffs, going 15-5 and helping the Wolves to the Calder Cup championship. He was awarded the Jack Butterfield Trophy for playoff MVP. After that display, Nurminen got the call in the 2002-03 season for the lowly Thrashers and did well for his first starting tenure in the NHL, after former AGM Byron Dafoe faltered for the Thrashers. In his first year, Nurminen played in 52 games going 21-19-5 as the starter and looked to build off that for the 2003-04 season. That season saw Nurminen getting more time in, playing 64 games and went 25-30-7, but with a 2.78 GAA to show. One moment in the season was during a February 2004 game where he and Ty Conklin got into a fight at center ice during a line-brawl. While it was fun for him, he filled in for Dafoe after Dafoe pulled his groin and left the game; thus the Thrashers had to play the last 1:49 without a goalie. 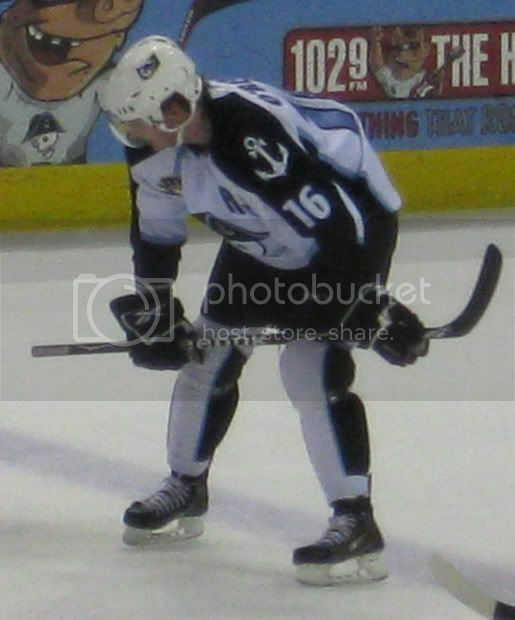 During the lockout of 2004-05, Nurminen went back to Finland to play for the Lahti Pelicans, playing 16 games and going 2-7-6. Nurminen got a better chance to go to Sweden to play with the IF Malmo Redhawks, playing 30 games there with a 2.94 GAA and three shutouts. 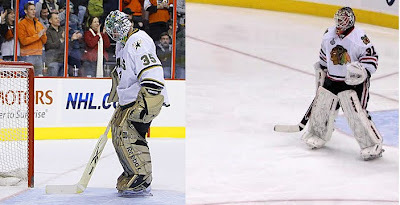 However, during that season-- Nurminen suffered a serious knee injury, serious enough for him to retire from pro hockey after that season, especially considering that fellow countryman Kari Lehtonen was the next big thing for the Thrashers. Currently, Nurminen is a partial owner of the Lahti Pelicans in order to stay close to home and is the goaltending consultant for the team. For many who called him "Nothing Saw" Pasi Nurminen, he did have a nice resume before getting to the NHL and because of someone younger and better coming up through the ranks, coupled with a serious injury for a goalie, made him fall by the wayside before anyone could see his full potential in his play. Even so, you could say he was one of the first to start the movement of solid Finnish goaltenders, even though he was only in the NHL for two seasons. Even so, he's now forever enshrined as part of the AGM family. Before I start, I will say that this will be something out there, something that probably is so far away from being true that if you believe-- you're a silly goose. That said, this is what came across my crazy mind while trying to deal with my everyday night stocking job. As you know, I'm not normally of the tin-foil hat brigade; but this is my venture into that situation. With the decision to void the 17-year contract the New Jersey Devils gave to Ilya Kovalchuk, it makes me wonder if this is just another line of things that has really gone crazy this summer in the free agent market. Especially considering the guy who gave Kovalchuk the contract, I almost wonder if it's some kind of "Arrested Development" situation. How is that?? Well, that's because the players (Kovalchuk in this case) are making a big commotion for wanting long-term contracts and big money as they play the role of the Bluth children. In this case, the owners were being represented by Lou Lamoriello as he played the role of George Bluth Sr. and got all distracted as the kids are making said commotion. All the while, the NHL played the role of J. Walter Weatherman and being the set-up man and stopping the Bluth kids complaining and proving the point that other owners and GMs wanted to in the first place. Yes, it's a stretch, but the point is valid. For many owners and critics; the long-term, front-loaded deals are something that are getting out hand and in this instance, finally called to the table and challenged. Now, with this whole thing, other contracts have been now re-opened and looked at with a fine-toothed comb. Roberto Luongo is one that has been confirmed as being looked at. Yet, why did it take so long for something like this to be challenged and for this to be come a big issue. Sure, it's been looked at prior and pushed to the wayside with the conclusion that it's nothing that is a problem; yet with this contract, immediate action was taken and rejected out of hand. All the while, the talk was why would Lamoriello, a guy very close to Gary Bettman when it comes to advising and being a strong voice for the Board of Governors, pull a contract like this-- especially after it was rumored that Bettman told Lamoriello it would get rejected if he actually signed Kovalchuk to this offer. For a guy who Bettman's trust with his opinion; it almost seems like a set-up and a way for Bettman/NHL to set an example for the other owners who may have done this before and those who were thinking about doing this in the future. Who else to use for an example than a guy who is held in the high regard and showing that if the NHL is going to do it to a guy like Lamoriello, they will do it to anyone who tries to pull something like this again. Even with this as an example, it's a way the NHL is trying to save the owners from themselves in giving these long-term, front-loaded contracts. Now, they have the guideline and know that the NHL will actually start to stick up for themselves and not sit on the sidelines when it comes to some of these outrageous contracts that have happened recently. The big issue, I suppose, was the huge drop-off of the contract in the end. It's not like Mike Richards, who does have a drop-off, but nothing that's as drastic as Kovalchuk's and Richards' is a slow decline and nothing out of the ordinary. Granted, the odds that the Devils will restructure and get Kovalchuk under contract before the month is up is very good; but it just adds to the whole mantra of this off-season, where the strange things get stranger by the day. It's a small win for the NHL and actually makes them look strong, even though you kind of saw it coming (if you're not a Devils fan, of course). Plus, gives me a chance to throw an "Arrested Development" reference in there. It's very rare that we do an AGM on a goalie still playing and even rarer that we do one with an adult league goaltender. However, with this being coinciding with Face Off Hockey Show's birthday (DOB: August 8th, 2001) and none of the rest of us being goalies-- we'll pay tribute to this fine fellow and hopefully he can build off of that. This week, we'll take a look at Marc "With a 'C'" Pitonzo. Pitonzo, born and bred in Severna Park, Maryland, never played organized hockey growing up. In fact, he only got into the goaltending role because of his brother Jonny strapping the pads on him and firing tennis balls and the like at him. In fact, Pitonzo first ventured onto the broadcasting side of things with FOHS and decided to start playing at the beginning of the 2002-03, after he bought his pads from eBay. Pitonzo joined the Blue Badgers of the Laurel Adult League in 2002-03, however he missed the first part of the season due to commitments with school (read: Fraternity rushing), but was able to join the Badgers with the second half of the season and take over for Brad Kirchner. In his rookie season, Pitonzo went 12-2-0 in his first season with three shutouts and help backstop the Badgers to the C-3 Championships in the LAHL, letting in only one goal in the two-game Championship series. With his rookie year under his belt, Pitonzo went into the second season with a big win under his belt and a new name. In 2003-04, the Badgers turned into D's Nutz and Pitonzo move forward playing 18 of the 24 games in the season going 13-4-1, but after making it to the C-2 Championship, the Nutz lost in a three-game set, two games to one. For the 2004-05 season, D's Nutz had a huge turnover in their system with a couple of players moving away, but had more talent coming in-- as per usual with adult hockey. It was a bit of a shaky season for Pitzono, playing only 16 games and winning only ten, but shined in the playoffs-- helping to backstop another championship team for the Nutz, his second in three years. Continuing with the shakiness, Pitonzo's 2005-06 campaign may be his most forgettable, with 20 games in and only 10 wins to his name. The Nutz didn't fair better, with them going out in the first round of the LAHL playoffs. Yet, it was the 2006-07 season where Pitonzo shook out the cobwebs and got back onto his winning ways. In 19 starts, Pitonzo put up 14 wins and five of which by shutout-- the most in his career thus far. However, the Nutz fell short in the playoffs, losing in the second round. However, with a new found confidence with his team, Pitonzo got back to work in the 2007-08 season. 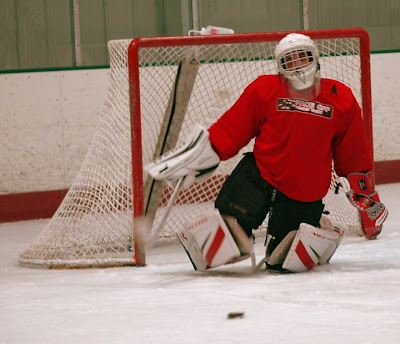 While his regular season wasn't the best (12 wins in 21 games with four shutouts), the playoffs showed Pitonzo's worth; backstopping the Nutz to the Bronze II Tier II Championship; his third in only six seasons of play. Yet, in the off-season of 2008, due to a freak beach injury during a figure-four leg-lock (don't ask, though he picked up the win with the Sharpshooter) Pitonzo was only able to play in six games, winning four of them, before getting surgery on his knee; putting him out for the bulk of the 2008-09 season. The Nutz had plenty of injuries to coincide with Pitonzo's, which is why they were eliminated in the first round. Once Pitonzo was healthy for the 2009-10 season, the competition around the Nutz stepped up and really got them off their game. 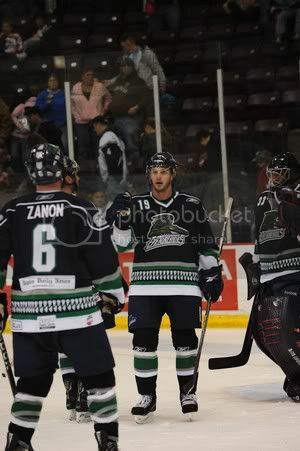 Pitonzo played 15 games in the 2009-10 season, going 2-11-2 with the Nutz only having five wins in the season and losing in the second round of the playoffs. There's a lot of hope in the future for Pitonzo, who's career is just starting to take off. Who knows where it could lead.....probably still in adult league, but still. It worked out well with the FOHS anniversary and gave me a reason to give a rundown of a friend's career and a former teammate of mine. Thanks for the Girl reminding me, she put up another issue of the HTIP chronicles. This time, one of the newer teams on the block with an interesting name, for sure. Meanwhile, a new name needed to be chosen. It seems the Mud Hens had been considering owning hockey and arena football teams for a while, and had actually registered the name "Walleye" with the US Patent and Trademark Office back in 2005, before they'd even purchased the hockey team. As for their arena football team, they pursued the name(s) "Woodpeckers" or "Peckers" or "Peckerheads". I kid you not. I know that doesn't have a lot to do with hockey or the Walleye name selection, but it is funny. The rest, you can read when you click this different colored, underlined link. Though, she did steal one team that I love the jersey of. Maxim Afinogenov joined Evgeni Nabokov and Denis Grebeshkov in heading off to SKA Saint Petersburg for the 2010-11 season in the KHL. They will join Alexei Yashin, Sergei Zubov, Sergei Brylin, Robert Esche, Alexander Korolyuk, Oleg Saprykin, and Joel Kwiatkowski as former NHLers playing with the club. Obviously, the team is trying to show that a team of unwanted NHLers could take down the KHL game-by-game....or not. While it's a bit of a surprise that no one wanted Afinogenov at the price he wanted (well, not really), the interesting part is why they are going to SKA over other teams there. It's almost turning into what Ak-Bars Kazan was during the lockout, who had Vincent Lecavalier, Alexei Morozov, Ruslan Salei, Slava Kozlov, Brad Richards, Alexei Zhitnik, Dany Heatley, Michael Nylander, and Nikolai Khabibulin. Granted, the caliber that Kazan had was much higher than others because of the lockout, but still. It's almost like a who's-who of players on a team like that. While the loss of Nabokov and Afinogenov could sting, it's a small sting. It's not something like if Alex Ovechkin, Sidney Crosby, or Drew Doughty would make a mass exodus to the KHL in the same time-span while they are in their prime; because then that would be a little worrisome. The NHL could even lose one, like say Ilya Kovalchuk for example, and still be fine. And maybe these guys heading over can actually prove they are worth it, albeit in a lower tier of competition for the most part, but it'll be something that could be a stepping stone to their next contract being in the NHL, like Nikolai Zherdev did. But it's not like these guys were really on the top of their game when they left, though some may debate Nabokov and how much of a loss he could be. That said, he won't get the money in the NHL he would in the KHL. They may be missed in some aspects, but as a whole-- they're going to be guys to replace them in the end. I don't know where the money is coming from for SKA to sign all of these players, but it could be hard pressed to beat the star power they seem to have right now. Whether or not that will translate to the ice or not remains to be seen and as we saw with the Lockout version of Ak-Bars; having the biggest names and the highest paid players isn't always the best way to go about things. Luckily, with former NHLer Darius Kasparaitis behind the bench as head coach, you can bet he's going to be able to deal with the NHLers coming over and get them to work as one unit rather than individuals. My hope, though, is that they will change their jerseys to something of a checker patterned to really validate my musical references to ska. Today, August 4th, the NHL held their press conference to talk about the Heritage Classic that will be held at Calgary's McMahon Stadium on February 20th, 2011 between the Calgary Flames and Montreal Canadiens. Luckily, myself and The Girl were able to attend, and thanks to Nicole Buckley and the NHL for allowing that to happen. The experience is none like I've ever been to. Sure, I've attended plenty of Drafts, but there's something about this press conference that was different and had a bit of a more personal feel to it all. Plus, it wasn't a whole slew of reporters, so the intimacy level and the ability to get some kind of one-on-one time with some of the players and team representatives (which I'll share in a bit) was pretty nice to have to. There was some kind of buzz around it because it is a special game, even if some think that the gimmick may run it's course if overused. In any case, the NHL did a great job to set-up the stadium like it would be for the game and to have the fancy dias with the boards as a background. Off the bat, the logo itself (seen above) is something that's simple, but works amazingly. With the mountains and Calgary cityscape on either side with the Bow River separating the two, it's something that is very well done and up there with one of the better event logos. As far as the jerseys-- first the Canadiens don't stray much, as they are going with close to their same jersey they use now, but I believe with some different font type on the nameplate and numbers. As for the Flames, that's the most extreme change. First, they are using a modernized-retro-hybrid (I'm patent-pending that, folks), which combines the Flames colors and the style of the Calgary Tigers from the 1920s. 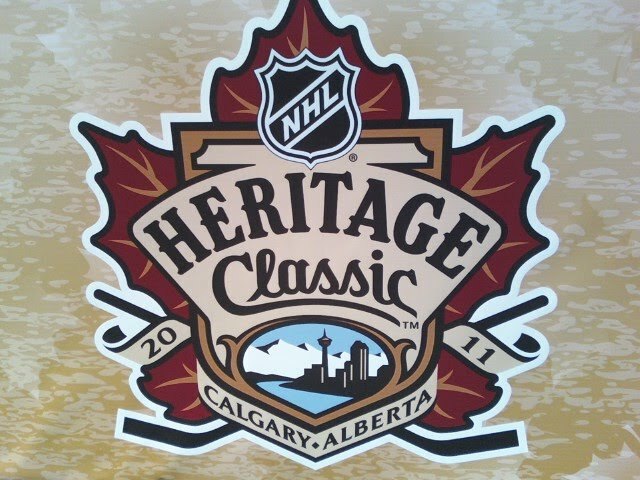 It's a great idea to bring the heritage of Calgary hockey, but keeping the Flames logo out there to the forefront. The one interesting thing to see is the cream colored pants that the Flames will wear with the jerseys. Not since the 1974-75 Washington Capitals have there been a light color pant used in the NHL and while it'll be good for a one-off game, it still be interesting to see how they look period-by-period. The intimacy that I talked allowed me to get some time in with Flames player Curtis Glencross. I asked him about what it felt like playing in a game like this and how he feels about the new duds. Next, I talked with the Flames President Ken King, who was able to talk about how the jersey came together and how the idea came together about getting the WHL's Hitmen to play the next day against the Regina Pats. Also, we got to to talk to Kevin Weekes, who was the MC for the event and very chill to talk to about the game. Sadly, didn't get to tape it because I'm a goose, but still. Nice to share some stuff with a former player of the game about one of the bigger events in the game. All-in-all, it was a great display and should be able to bring a lot of buzz to Calgary and the hockey community around it. The one thing I forgot to ask Mr. King and something he brought up is the weather. Calgary weather is very....odd, to put it lightly. It'll be interesting to see how the weather will hold up for this game and if it'll be a factor in one extreme to another. Hopefully, I'll be able to do a post about the experience at the actual game, but only time will tell. Since it's the dog days of summer and the announcement of Rod Brind'Amour's number 17 being retired by the Carolina Hurricanes, it made me get into The Hockey News' "Greatest Jersey of All Time" issue and look at the teams who don't have any numbers retired. 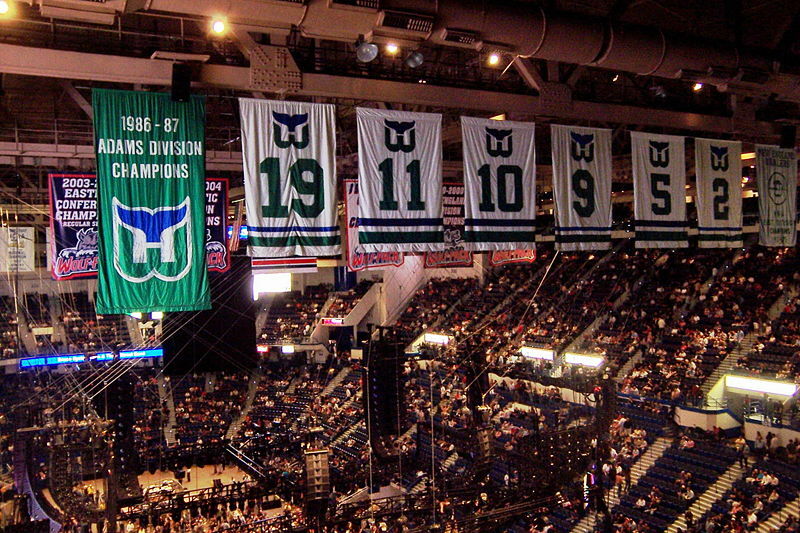 Since all the teams have been in the league for 10 seasons, it's about time to look at who could be hanging from the rafters of the eight teams who don't have numbers retired. ANAHEIM DUCKS: While the obvious guys like Paul Kariya, Teemu Selanne, and J-S Giguere will be seeing their numbers hanging from the Honda Center when their careers are done; the candidate now will probably be Guy Hebert, who was the first "face" of the organization. He may not have had the best stats, he was the guy who backstopped those expansion years and held down the fort for the most part. ATLANTA THRASHERS: The odd part about the Thrashers is that all the big names are nowhere close to retirement and kind of left on shaky terms (read: Dany Heatley and Ilya Kovalchuk), so it's hard to figure out who could be next. While Dan Snyder's number was not officially retired, just taken out of circulation; maybe Ray Ferraro could be considered since he was one of the first bigger name players to start off the Thrashers' appeal. If not, Slava Kozlov may not be too far off from retiring and could be the first to have his number officially put up there. COLUMBUS BLUE JACKETS: There's no question that David Vyborny should be the first guy have his number retired. Vyborny was on the original Blue Jackets roster and stayed there until he was done his NHL career and went home to his homeland in the Czech Republic. As it is right now, he's at the top of the Blue Jackets' all-time points, albeit they've only been around for ten seasons....still. If there's one guy who deserves to be there, it's the OG of the Jackets. FLORIDA PANTHERS: While you have plenty of guys viable, mostly from the 1995-96 team (Scott Mellanby, Brian Skrudland), but there was no one more of a face to that team than John Vanbiesbrouck. He was a big reason the Panthers got to where they did in their Cup run and really one of the first names that came out of the expansion team and made them successful from the start of their organization. MINNESOTA WILD: While they did the hack retirement of the #1 for the fans, Wes Walz should be the first official and proper number retired. Like Vyborny, Walz was with the Wild from the start and he was someone who encompassed the team by playing hard-nosed and being the little guy who clawed to get where he needed to be. He was much beloved, as well-- which should help the process along. NASHVILLE PREDATORS: When he retires, expect David Legwand to have his number retired, but beforehand, maybe look at Cliff Ronning for the first to go to the rafters or even the first captain Tom Fitzgerald. An dark horse could be Mike Dunham, but I don't think he left too much of a mark, but maybe more than Ronning and Fitzgerald. SAN JOSE SHARKS: While Doug Wilson was the first captain, Arturs Irbe and Owen Nolan could be prime candidates as the first to be retired, Nolan having to wait until he's actually done with the game for it to happen. Maybe with Sandis Ozolinsh being an outside guy to steal the first Sharks being raised. You could make a point for Jeff Friesen for his time in the Shark Tank, but that would be a little odd considering what he did after he left the Sharks. TAMPA BAY LIGHTNING: The toss-up for the Bolts could be between Dave Andreychuk and Brian Bradley. Andreychuk was the guy who captained the Bolts to their only Cup championship to this point, but he wasn't the offensive force that Bradley was in his tenure with the Bolts. He turned it on when he got to Tampa and really showed what he had, albeit on a weak team. Even so, I think Bradley should get consideration first for overall achievements with the team. There could be a debate for the Ottawa Senators, who retired Frank Finnigan's #8 from the non-expansion days, but don't know how the people feel about that; so I didn't include them. This is the time where you have to dig into the bag for things to ponder and during retirement season, it's a good choice to wonder about who could be the next going to the rafters. Especially when you have so many teams worrying about the "what have you done for me lately" ideal when it comes to retiring numbers rather than overall to the franchise. The dismantling of the Stanley Cup champions continue, as the Chicago Blackhawks walked away from their Cup winning goalie Antti Niemi's arbitration reward (one year, $2.75M). Instead, they take a more affordable option of Marty Turco, who was out there on the market forever, who's contract is reported to be over one million dollars less; as Turco signed for one year at $1.3M. The one thing about Niemi that I don't get is the awe surrounding him. Sure, he did win a Cup; but he does remind me of a modern-day Johan Hedberg as a guy who came out of nowhere and took over the league by storm because no one knew much about him. While Niemi had a longer regular season stint and played well, as well as winning the Cup; but had the same scheme where they may have just been good because people didn't know how to read them like the goalies who had been in the league prior. That's not to take anything away from Niemi-- just calling it how I see it. That said, I don't know how I would feel about taking Marty Turco over Niemi. Turco has all the goods, but does him being shell-shocked in Dallas the past two seasons make him a better option than a guy who's coming off a Stanley Cup victory from out of nowhere?? Niemi had better regular season numbers than Turco, sans save percentage; but the defense around Niemi was probably leaps and bounds over what Turco had in front of him. If you put Turco with the quality of what the Hawks have, it could turn his career around. The age thing is another factor, with Turco turning 35 in the middle of this month and Niemi is going to be 27 at the end of this month. Turco hasn't been injured as often as some older workhorses, but there's always that worry he could go down at any time, which would make the move that much worse if Niemi goes on and has a stellar year wherever he lands. All eyes will be on Turco to succeed, especially in the Chicagoland area, who have a reason to be pro-Antti Niemi. Speaking of which, where does Niemi go now?? A Cup winning goalie, under 30 years old, and able to steal games if need be and actually be effective. Sure, you'll have the obvious teams with shaky goaltending dispositions (Washington, San Jose, Philadelphia); but at the same time-- could he be hung out there without a suitor for a while and have to wait until another guy goes down in order to get a gig as a starter in the NHL?? In the end, this adds to the dismantling of the Stanley Cup Champs and the oddities of the NHL off-season; along with Ilya Kovalchuk's situation-- it's been a bizarre summer. Turco has a lot to prove, but doesn't need to do much to prove it. He's a solid goalie and behind that Chicago's defense; he'll regain what he lost in Dallas. Niemi may have a lot of people after him, but can't afford to take him on because they don't have the money to bring him in. 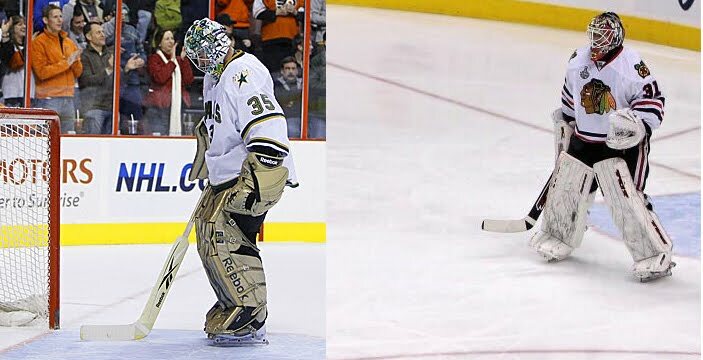 It could be a situation where Niemi is sitting on the side, losing his allure and prowess because teams have to wait for someone to get injured. This week, we go back in time again to a place where you could flop back and forth from league to league as the WHA was there to compliment the NHL. Plus, though this week's AGM had a short career in the NHL; his legacy will live on as one of the more remembered and intimidating masks in the history of the game. This week, the profile of Gary "Bones" Bromley. To start off his career, Bromley would play with the Regina Pats in his junior career. He'd carry the Pats to the Memorial Cup finals in his first season in 1968-69, but the Pats and Bromley would be swept by the Montreal Junior Canadiens in the Cup Finals. After putting in 34 games for the Pats and a 3.57 GAA in the 1969-70, Bromley was loaned out to the Weyburn Red Wings for the Memorial Cup finals; as their goalie was injured. Bromley saw two games of action, but would go 0-1 as the Red Wings lost to the Montreal Junior Canadiens in a four-game sweep. As the Pats moved to the newly formed WCJHL, Bromley got more time seeing 42 games of play with a 3.71 GAA for the Pats; but no Mem Cup appearance for Bromley this year. Bromley was signed by the Buffalo Sabres in the fall of 1971 and went pro in the 1971-72 season with the Eastern Hockey League's Charlotte Checkers. Bromley would see 27 games of action with the Checkers and would register a 2.70 GAA and four shutouts in that time. He would also get called up by the Cincinnati Swords of the AHL for three games and went 1-1-1. Bromley would see all AHL duty in the 1972-73 season, playing with the Swords behind Norm Farr, with Bromley performing well going 19-5-3 in 31 games of action. Bromley started the 1973-74 season with the Sabres, playing in 12 games and going 3-5-3 for the year, but would be sent down to the Swords again for a stint of 34 games, amassing a 19-11-3 record. Bromley would stick full-time with the Sabres in the 1974-75 season and took over the starting role, as well. Bromley played 50 games that season, going 26-11-11. Injuries, however, took their toll on Bromley in the 1975-76 season. He would only play one game for the Sabres going 0-1-0 while playing in the AHL with the Providence Reds for seven games, going 4-1-1 for the season. The Sabres did not re-sign Bromley after the season. With little options in the NHL, Bromley traveled to the WHA. In 1972, Bromley was select in the WHA Draft by the New York Raiders, who moved to become the San Diego Mariners. Then his right were traded to the Calgary Cowboys, which is where he landed for the 1976-77 season. Bromley would play behind Don McLeod and see 28 games with a 6-9-2 record. The Cowboys folded after that season, which allowed Bromley to sign with the Winnipeg Jets. Bromley would spent the 1977-78 season with the Jets, going 25-12-1 alongside Joe Daley and Markus Mattsson, helping the Jets win the Avco World Trophy for WHA champions. With a new revitalized career, Bromley would sign with the Vancouver Canucks for the 1978-79 season. He would start out in the Central Hockey League with the Dallas Black Hawks going 2-1-1 in four games before going up to Vancouver to play along Glen Hanlon and Dunc Wilson. Bromley played 38 games and went 11-19-6 and would go 1-2 in the three game playoff loss for the Canucks. In 1979-80, Bromley would start off with Dallas again, playing 21 games going 8-9-3 before getting called up to play behind Hanlon, playing 15 games and going 8-2-4, playing all four playoff games and going 1-3 in them. 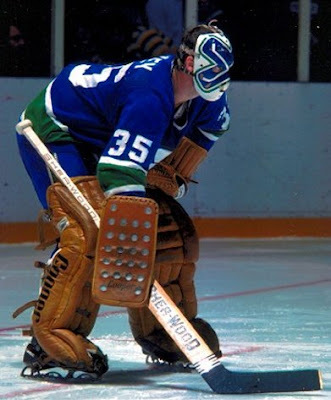 Bromley would again start the 1980-81 season off in Dallas due to a groin injury and play two games, going 1-1-0 before heading to Vancouver to play behind Richard Brodeur and get 20 games in, going 6-6-4. However, the odd part about the 1980-81 season was that Bromley was actually traded during the season, but still played for the Canucks. Bromley was a part of a deal to go to the Los Angeles Kings, but with Hanlon and Broduer being injured, he stayed in Vancouver under a contingency plan in the trade. Also in his time with Vancover, his iconic mask got a lot of attention. With Bromley being 5'10 and 149 points, the nickname "Bones" was something that came with the lankiness he brought. Because of it, he had his mask painted in the skull shape (as seen here), which made it an intimidating sight for shooters breaking in on him. Bromley would play the 1981-82 season in the AHL with the New Haven Knighthawks after the trade. He would go 22-17-3 in 44 games with New Haven before he would call it a career in hockey. While his mask stood out more than his career may have, the fact remains that Bromley will have left his mark with a stylish mask in the days where it wasn't common place to paint the mask the way he did, which paved the way for the artwork we see today. Add that to the fact he wore it with the Canucks' "flying V" jerseys-- definitely instilled in the memory of everyone around.